Christos Tsirogiannis is conducting important research on the Medici Dossier. 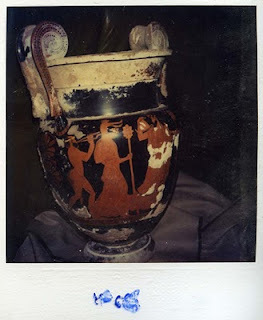 A polaroid in the archive shows an Attic red-figured calyx-krater with a Dionysiac scene. The krater is still encrusted with mud and salt deposits; it appears to be fresh out of the ground. On the front is a lively procession, with the wine god Dionysus amid his entourage of cavorting satyrs and maenads, or female devotees. Of particular interest is the child-satyr who, in an apparently unique representation, rides on the shoulders of one of the maenads. The child-satyr is seen quite clearly in this image. The krater was acquired from Robin Symes in 1983 (see Star Tribune November 14, 2005, "The Minneapolis Institute of Arts bought its vase "in good faith" from Robin Symes, ... said museum spokeswoman Anne-Marie Wagener", archived here) and was reported by Michael J. Padgett to have been "in private collections in Switzerland and Great Britain for ca. 15 years before 1983". The Star Tribune also reported in 2005 that the acquisition had been "recommended" by the MIA's then "head curator" Michael Conforti, an advocate of the "licit market" in recently surfaced antiquities. The apparent appearance of the krater in the Medici Dossier suggests that the krater was indeed once in Switzerland. It is also a reminder that "Swiss private collection" does appear to be a euphemism for something else. Padgett also commented on the attribution to the Methyse painter. When Robert Guy saw the krater on the London market, he noted its resemblance to the style of the Methyse Painter but stopped short of an attribution. After its acquisition by The Minneapolis Institute of Arts, Dietrich von Bothmer examined detailed photographs of the vase and confirmed an attribution to the Methyse Painter (letter of 17 February 1984). The Polaroid SX-70 that provided an instant colour print was apparently introduced to the market in 1972 and this seems to provide a terminus post quem for the image. The appearance of a mud-caked krater in a Polaroid image suggests that the collecting history does not stretch back to the late 1960s as Padgett had indicated ("for ca. 15 years before 1983"). One wonders if this timescale had been adopted to place the krater prior to the 1970 UNESCO Convention. It is known that Italian prosecutor Maurizio Fiorilli is keen to have the krater returned to Italy. He specifically mentioned the MIA in an interview for the British press in November 2009. The Director of MIA, Kaywin Feldman, has taken a critical position of Italy in the recent revisiting of the MOU. Now she has the opportunity to show that she is keen to co-operate with the Italians. It is, after all, nearly five years since it was pointed out that the krater appeared in the Medici Dossier ("A Greek vase owned by the Minneapolis museum appears to match a photo of a vase that Italians say was looted": "Italy claims Minneapolis museum holds looted vase", Star Tribune, November 9, 2005), and over four years since the MIA was said to be "researching the vase" (Steve Karnowski, "To protect the treasures, museums find detective work pays", AP, June 14, 2006), and approaching three years since Feldman was appointed to the MIA. Recognizes the 1970 UNESCO Convention as providing the most pertinent threshold date for the application of more rigorous standards to the acquisition of archeological material and ancient art. Widely accepted internationally, the 1970 UNESCO Convention helps create a unified set of expectations for museums, sellers, and donors. AAMD deplores the illicit and unscientific excavation of archaeological materials and ancient art from archaeological sites, the destruction or defacing of ancient monuments, and the theft of works of art from individuals, museums, or other repositories. I presume that Feldman will release the details of the MIA's internal enquiry (presuming that a report was compiled). If it is accepted that this krater surfaced via Medici, will the MIA be handing the krater back to the Italians? From the Medici Dossier courtesy of Christos Tsirogiannis.